The Mountaineers has historically made technology decisions based on immediate needs, without a clear focus on governance, effectiveness, or efficiency of the entire technology environment. While this has allowed us to change how we run the organization for the better, it has also been a challenge for us to keep up with the pace of change. In this project, we've taken a proactive and strategic approach with a holistic view of how we've used technology in the past and examined the possibilities for how we'd like to use it in the future. In 2010 we started gathering feedback from volunteers, members, and guests that became the outline of our design requirements. Starting in May 2013, we created our website using an "agile development" process which allowed us to test our website as we created it. We completed internal functional development (how stuff works) and testing, and content development (words and images) in late February 2014. We conducted external "beta" testing with a group of key volunteers from around our organization in March to April. The final week of April and early May we spent fixing the bugs uncovered during testing and completing the content development. We launched on May 5th, an ideal launch date because it is a transitional period for us. Many courses that started in winter and spring are winding down and the spring and summer activity programs are just starting to wind up. Our ultimate goal with our new website was to simplify and improve as many processes as possible. We designed and built simple tools for our leaders, making it easier for our volunteers to volunteer: schedule and manage activities, schedule and manage courses, manage committee rosters and documents. Are you a leader? Learn more about all of these features on our Leader Resources page. We improved the process for people to join, register for courses and activities, and donate. We added new features like our badges and blogs and created new web pages where people can easily learn about who we are, what we do and where we gather. We are quite pleased with the results. Our new website is friendly, contemporary, and modern. Our courses and activities are more accessible, making it easy for everyone to explore, learn about and protect the outdoors with us. 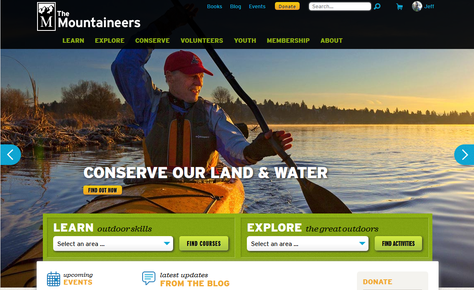 We created a blog that highlights our skilled volunteers, showcases our diverse conservation efforts, and directs everyone to our vast portfolio of outdoor knowledge. As you can imagine, we’re excited about this project and what it means for our members and our programs. Watching this evolve from early user interface discussions to a nearly completed system has been fantastic. But we’re not done... and, arguably, we will never be done. Our launch on May 5, 2014 was just the beginning of a constantly evolving technology platform. We will work to continually enhance our new website with improvements and new features to better meet our needs. Integrating book purchase into the shopping cart so that members to purchase books along with a membership and course. Importing activity and course history so that members can review what they’ve done and staff can create reports. Note that all prerequisites one might need for activity registration are the badge rosters that were imported at launch. Improved accounting functionality and integration. Improved course functionality, mostly aimed at making instructor registration easier to find and mange. Map search in addition to the list-style faceted search for activities, courses and Route & Places. A cool feature that requires a small amount of development. Log on to feedback.mountaineers.org, our feedback and help desk system powered by UserVoice, and tell us about it! Before we started using feedback.mountaineers.org to organize ideas and report on their status, we kept them in spreadsheets. The Future Website Enhancements Archive folder contains all of these.